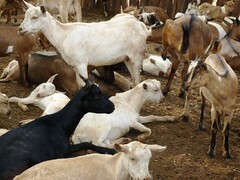 The imGoats Mozambique national steering committee held its first meeting on the morning of 2 June 2011 in Maputo at the Mozambique National Agricultural Research Institute (Instituto de Investigação Agrária de Moçambique – IIAM). The meeting was attended by representatives of the national agricultural research institute (IIAM), the Inhambane provincial livestock services, the International Fund for Agricultural Development (IFAD), the United States Agency for International Development (USAID), CARE International and the International Livestock Research Institute (ILRI). The invitees from the Animal Production Department of the Ministry of Agriculture sent apologies. The purpose of the meeting was to review the project activities to date, to discuss how best to address the value chain constraints identified during the innovation platform meeting, and to explore possible linkages with other projects.